The Kelvingrove Organ Booklet and CD: A short history by Dr James Hunter. 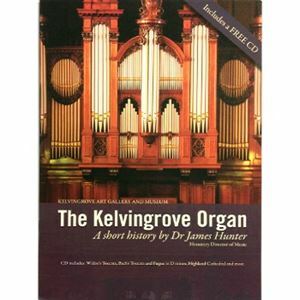 The organ at Kelvingrove Art Gallery and Museum has a long and esteemed history. A product of excellent Victorian craftsmanship, it remains one the finest instruments in public ownership today. 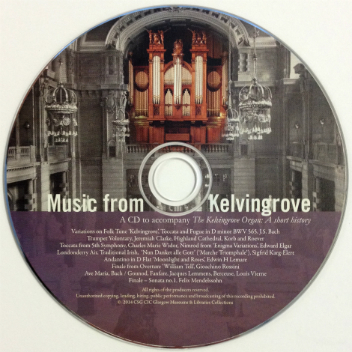 Visitors to Kelvingrove still enjoy listening to its music, thanks to the organists who give generously of their skills and time. 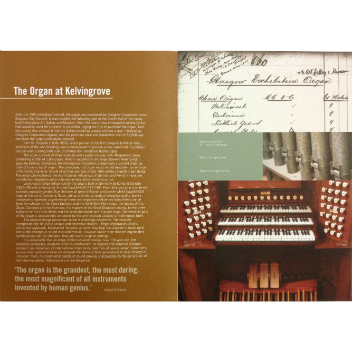 Revealing the full story of the organ for the first time, proceeds from the sale of this booklet and the accompanying CD will assist in safeguarding its future.